Hands stay dry in the rain. Even at low speed or standstill. Fingers stay significantly warmer, due no wind chill. The gauntlet-flare directs wind/rain away from arms. Bulky, costly cold weather gloves (or electric) are history. In blazing sun hands shaded, lower sunburn/melanoma risk. Bug guts, stone hits on hands are also history. Electric grip warmers work better on back of hands too. On/off with no tools in 3-4 minutes. Lock-to-lock steering and cruise control work as normal. 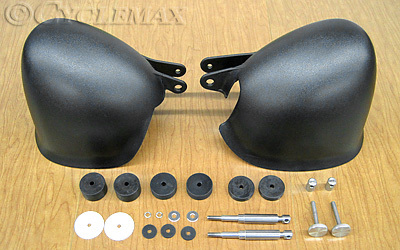 HelmetPosts included at no extra charge. Wingers have the best weather protection on two wheels – but not for our hands. Fingers are the most-exposed extremities, yet the most necessary. In cold/rain they get stiff, slower to react. Cold fingers also distract your concentration. When it rains, soaked gloves get much colder; waterproof ones are still wet outside the water-resistant membrane, often seeping at the seams. Drying out favorite gloves is a nuisance and it's bad for the leather. Wind chill's not news. But did you know it'll near-freeze your pinkies at 45 degrees? Or, did you know blasting hot air is even more uncomfortable than hot, still air? HandGuards provide shade from blazing sun, reducing sunburn on the backs of hands – and some melanoma risk. On perfect days, HandGuards have little temperature effect either way. We leave ours on regardless. But, if you prefer, they take very little space when stuffed with rain gear. However once you've experienced the difference in sudden adverse weather changes, which happen to every rider – you'll never be caught without. They are aerodynamically engineered with flares to direct wind over and under wrists, not blowing up sleeves; they actually act like gauntlets. We now wear fingerless gloves even in the cold, preferring to 'feel' the buttons, switches and levers. Honda's heated grips work great, even through our Kuryakyn grip covers for bigger hands. Previously, the inside of hands were hot while the backhands were cold. Now heated grips actually warm both sides; no wind chill makes all the difference. Bulky heavy gloves are history. That's preferable because they are so un-tactile. Lower-protection hand fairings have become standard equipment on some rides, such as on hot Ducatis. Available also for BMW, Harley, KTM, others ... but not Goldwings. Until now. It was worth the wait – ours are the most protective available. Partial wind deflection is better than none of course, but rain/wind still hits your hands. Not so with HandGuards. Attachment is as 'OEM' as it gets. Polished 316 stainless bolts simply replace Honda's own; 316 is more costly, but it's the best. HandGuards are made of UV-resistant ABS – Honda's bodywork is also ABS. We made them to match the GL1800's dash leather grain. They're not cheap ... because they're not cheap. Our $25 HelmetPosts are included, no extra charge and useful several times a day – even if you remove the HandGuards for a while. Hard-over steering lock? No problem. Cruise control is unaffected: Worth mentioning because certain fabric hand protectors we bought online killed cruise control constantly by hitting the levers in wind. Utter rubbish frankly, stay away. Cruise control means using only hard hand protection. Having tested them for our own use for years in hot/cold, wet/dry, and many countries, we can attest they really are as the name claims,"Perfect."